The spillway from Lake Bluestem creates wonderful cascades in Pawhuska. Hit the road and explore these amazing sites in Oklahoma where natural streams, waterfalls, rivers and lakes will take your breath away. Turner Falls Park in Davis is home to Oklahoma’s tallest waterfall. Soaring 77 feet, a roaring gush of water plummets into a natural swimming pool below. Pack a picnic, bring your bathing suit and get ready to soak up the sun while swimming underneath this Oklahoma landmark. Turner Falls Park also offers hiking as well as caves to explore within the ancient Arbuckle Mountains. Pitch a tent or rent an RV camping space and make a weekend out of your trip to Turner Falls. Located just off I-35 and Highway 77 in Davis, the park is hard to miss. While swimming is not allowed under the waterfall, there is a side area where visitors are free to splash around in the water. There is also an observation platform at the waterfall’s base offering breathtaking photo-ops as well as a catch-and-release fishing area and plenty of trails for hiking. For well over a century, the Chickasaw National Recreation Area in Sulphur has delighted visitors with cold, freshwater springs and awe-inspiring surroundings. Enjoy the rush of water as it cascades over a variety of small waterfalls found along the area’s Travertine Creek. Stop for a picnic around Little Niagara, a scenic and popular swimming hole, and plunge into the clear waters for a refreshing dip. Hike or mountain bike along the area’s numerous trails, or bring burgers and hot dogs for cookouts – the park’s outdoor grills are popular features during the spring and summer months. Just head east of I-35 on Highway 7 for a memorable trip into one of Oklahoma’s most beautiful areas. If you’re looking for an off-the-grid experience, head to Atoka and go hiking in the McGee Creek Natural Scenic Recreation Area. These trails lead to quaint cascades found along the banks of serene creeks filled with sparkling water. The area is a “quiet-water zone” and no vehicles are allowed. Park your car in designated parking areas and collect your free permit, required to access the over 20 miles of trails, at the Natural Scenic Recreation Area office. Once you have your permit in hand, you are free to cycle, hike or ride your horse along the designated paths filled with stunning waterscapes and lakeside shoreline. The fast flowing waters of the spring-fed Blue River in Tishomingo create picturesque waterfalls and cascades as they surge over the area’s natural stone outcroppings. This popular fishing river offers bass, catfish and crappie, as well as stocked trout in winter. Pitch a tent in the nearby Blue River Campground and enjoy splashing around in the river’s unspoiled waterways. To truly get out on the water and experience the current, rent a kayak and make your way down this river’s falls and ledges. Public access points are limited and a Blue River Conservation Passport may be required before you begin your exciting trip. Check with the Oklahoma Wildlife Department for availability. The charming town of Medicine Park was planned around Medicine Creek. Explore this historic resort town and find a perfect swimming hole near one of the creek’s cascades. Jump in to Bath Lake Swimming Area to cool off during a hot summer day or enjoy the sound of rushing water as you stroll across one of the creek’s bridges in the fall. Head out just a little to the west of Medicine Park to Lake Lawtonka, one of the area’s most popular outdoor attractions where you can go water skiing, boating and more. The Wichita Mountains Wildlife Refuge in Lawton is one of the most geographically interesting places in Oklahoma. Take a hike near Lost Lake and seek out the area’s Forty-Foot Hole. Cache Creek flows through this small gorge creating stunning waterfalls over ancient rock formations. Mountains tower on either side giving the canyon its name. Hike along Bison Trail that leads you southwest of Lost Lake and you’ll find this rewarding destination with plenty of great photo opportunities and picnic spots. You may also see wildlife along the trail such as elk, prairie dogs, longhorn cattle and even bison. Jump in to Bath Lake Swimming Area to cool off during a hot summer day or enjoy the sound of rushing water as you stroll across one of the creek’s bridges in the fall. In the prairie of northeastern Oklahoma, Lake Bluestem is a beautiful spot to camp and fish near Pawhuska. It is also home to Bluestem Falls created by the Bluestem Lake Spillway. 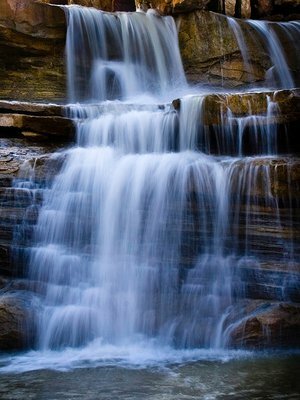 Below the spillway, the water tumbles over cliffs of shale and sandstone making this quaint spot picture perfect. To get to the miniature falls, take Kihekah Avenue north from the center of town until you reach CR4070. Turn left on CR4070 and continue over three miles until you come to a fork in the road. Take the left road of the fork towards Bluestem Lake spillway and enjoy this secret spot. Located in Okmulgee State Park, the Dripping Springs Lake Spillway in Okmulgee was built by the WPA and CCC during the Great Depression. This impressive feature turns the gentle current of the water into gushing falls as it flows over the spillway. Take a camera to capture all of the action and don’t forget your fishing rod. Dripping Springs Lake is one of the best locations for bass fishing in the state. The park also boasts over three miles of hiking trails, RV sites, tent camping sites and plenty of opportunities for water recreation including swimming and boating. Located in one of the most serene outdoor areas in the state, the Mountain Fork River is a waterscape paradise. The gentle current, which runs directly through Beavers Bend State Park in Broken Bow, flows over large rock formations creating numerous cascades on the Lower Mountain Fork River. This stretch of waterway is ideal for canoe and kayak trips with numerous outfitters located along the river banks and gorgeous views around every bend. Enjoy camping, cabin rentals and river access at Beavers Bend State Park, or venture below the park for other access points near the dam or near the rapids of Presbyterian Falls. The Spavinaw Area of Grand Lake State Park is a popular spot for fishing and picnicking. Spavinaw Lake’s clear blue water flows over the spillway’s ledge and creates a beautiful, tree-lined stream below. Bring the kids and enjoy the tranquil, shallow swimming area created at the base of the falls. Fishermen enjoy the excellent fishing for channel catfish, walleye and bass below the spillway, while families delight in the variety of shaded picnic areas that dot the park. Tent camping sites and RV hook-ups make it easy to plan an extended trip to this picturesque state park, and hiking around the nearby wildlife management area is a fun adventure for the entire family. Each of the 1,300 miles of shoreline that make up Grand Lake in Grove has something special – waterfront cabins, marinas and gorgeous views of the water from every angle. One of the state’s most popular vacation spots in the summer, you’ll want to explore the lake’s 45,000 surface acres while water skiing, jet skiing or relaxing on a boat. For a real thrill ride, try parasailing at Sail Grand. The area is also home to the Pensacola Dam, the longest multiple arch dam in the world. The water roars as it flows through the 150 foot tall structure, creating exciting waterscapes as it empties into the riverbed below. Directly below the dam, you’ll find some of the country’s best ATV rock crawling. If you’re looking for a mixture of history and nature, Heavener Runestone Park in northeastern Oklahoma needs to be a stop on your bucket list. Make your way down the stone staircase to discover a massive boulder with mysterious Viking-era carvings etched into its side. At ground level, you’ll get the best view of Heavener Runestone’s waterfall, which gently glides off a cliff and into a fountain. Bring a picnic and sit along the area’s rock outcroppings. From there, take in the vast expanse of the Ouachita Mountains and imagine Norsemen roaming the same land more than a thousand years ago.